If you're visiting from the Let's Get Acquainted Blog Hop, welcome! Thanks to Beth for including me. I'm currently having a giveaway and have a few new lovely followers so hello to you too! A quick introduction... I'm Lucy, wife, mum to 2.5 kids (a boy, a girl and one due in January). We live in Manchester, UK. I started this blog about a year ago as a way to document the stuff I make. I had no idea what an awesome quilting community existed online and am thrilled to have been lucky enough to make some fantastic blog friends. I mostly quilt, have a new found love of embroidery and occasionally make utter rubbish out of cardboard with my kids. Please check out the pages on the tabs above to see some of what I've made (the sewn stuff not the cardboard crap!). I take part in too many quilt-a-longs and swaps and generally can't keep up but I'm having a great time trying. I have started a little obsession with cubes lately and decided to create a tutorial for the Blog Hop. I have two makes, a cube pin cushion and a baby block (random? yes but definitely useful for gifts!). The principal is the same, although the method is slightly different. I'm doing some English Paper Piecing (EPP) for the pincushion. If you've never done any EPP before I recommend taking a look at this tutorial by Clare. These projects are really simple, can be done in front of the TV and are a great way to use up scraps! I have included the sizes of templates I used but you can make them whatever size you like. Chose a layout and then take a picture! Cut a 2" square out of cardboard - I used a cereal box - you will use this inside the box to give a bit of stability. sorry - late night shot! To sew the edges together, use a ladder stitch (slip stitch), forming a cube shape. Leave two adjoining sides open for stuffing. On one edge I inserted a bit of ribbon (just stitch through the ribbon as you stitch the sides together) so the pincushion can be tied onto a pouch or wherever you keep your sewing supplies. Once you've reached the final two seams, rip out the basting stitches and the papers. Place the cardboard in the bottom of the pincushion and stuff with filling of your choice - I use polyfill. Sew the final seam closed using a ladder stitch. These make cute gifts and are handy to have around! The fabric I used is Button Box from the Walnut Hill Farm collection by Blend, available here. 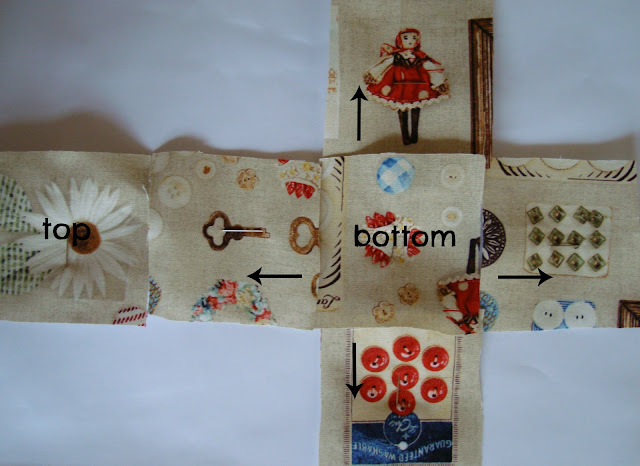 You could make this the same way as the pin cushion if you wanted to fussy cut your fabric. I used a 3" inch square to draw my template. Pin to the fabric and then cute round, creating a 1/4' seam allowance. I snipped slightly into the corners to make it easier to baste. Baste and then sew together the sides of the block using a ladder stitch. Leave two adjoining sides open for stuffing. Once you come to the final two seams, rip out the basting stitches and paper and stuff with polyfill. Then stitch up the opening. You can leave the papers in if you chose (I did!) - it gives a nice crinkly sound that babies would enjoy!! You can make stacks of these blocks (I haven't had time) and there are so many possibilities. You could embroider them with different animals or pictures, applique letters onto each block to spell out the baby's name, make I-spy blocks, number blocks, the alphabet, etc. The fabric I used is ABC 123 in Manilla from School Days by American Jane, it's available from Fresh Squeezed Fabrics here. If you make any blocks using these tutorials please link back to this post and leave a comment with a link to your blog/pictures below. Thanks! p.s. You get major brownie points if the title of this post made you think about a Christian Slater film!! nice to meet you! Those cubes are cute. I set of those woould be a great toddler gift! Great tutorial, Lucy! I'm going to have to try the pincushion. Boohoo no brownie points for me! Lovely tutorial. Love the pincushion! Really cute projects! Thanks for sharing, Lucy! These are a great idea, and they're really sweet too! Thanks for such a clear tutorial. Cute cube!! Thanks for the great tutorial! Great idea and tutorial! I love this. Hi Lucy nice to meet you. What an awesome tutorial. Love it! Thank you for sharing. I have never made a cube before and I'm so excited to try!! I think a set for our new grand baby is a great idea! Thanks for the tutorial. Your cubes are really fun! Your cubes are so cute--your fabric choices are outstanding! P.S. No brownie points for either. I think I'd be able to pick Christian Slater out of a line up...only think though!! great tutorial! i want to make some for my wee one! also fun to learn a bit more about you! Oh, those are cute. Great tutorial! Lovely tutorial and the cubes are so cute! I love your cardboard and fabric makes!! Cute cubes, nice to meet you too! Nice tute! Cute blocks, and great pix. Nice to meet you! Glad to say I've been a fan since you started blogging! These are so cute Lucy! I so going to make these this week while I'm sewing machine-less! What a great idea! I love the cubes! I can definitely see making these with favorite scraps. Very cute cubes! Love that idea for a pin cushion! What an excellent pin cushion tutorial! Thanks for sharing. These cubes are so cute - thanks for the great tutorial Lucy! Darling cube and nice to meet you! Nice to meet you. I see we have 2 things in common. The Tetris QAL and the Get Acquainted Hop. My date is in another couple of weeks. I like your tutorial. Just might work for an idea I've had for awhile now. Thanks for sharing. Love the pincushion blocks! So cute and great idea to attach them! Nice to meet you! I love love love the little fussy cut cube pincushion - too cute! I will be making one of those for sure :) So nice to meet you. It was nice to meet you! I am loving those little cubes! I needed an idea for quick baby gifts, especially something I can give to a boy! So great to get to know you better, Lucy! I love those cubes!! techniques for new blog owners please share. I understand this is off topic nevertheless I just needed to ask. Eye need sleep and a winner! FoQ, friends and a Japanese scrap giveaway! ET Turn Up the Volume!